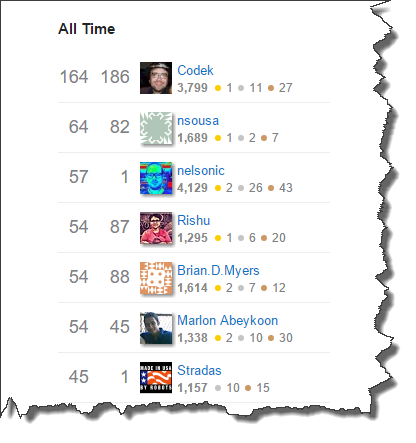 In the top answerers section for All time in here shows my name in 6th place. 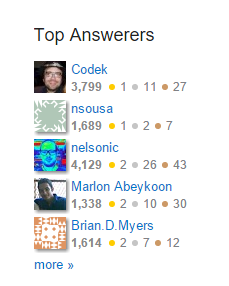 But in info section of the tag here shows my name in 5th place. Why there are two different calculation logic for the same top answerers list in two different places? The two of you have 52 votes so it is undeterministic which of you will be fifth and which sixth when ordered by that value. Perhaps it should be ordered by upvotes DESC, number_of_answers ASC so the person with the highest average is ordered first in that case (though there will still also be a possibility of ties in that case too and something unique such as userid could be used as a final tiebreaker to ensure stable results). ... doesn't even make the top 5 in the other list. Not the answer you're looking for? 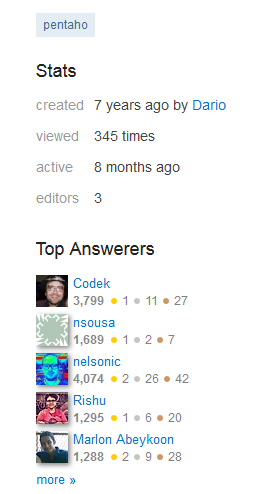 Browse other questions tagged discussion bug top-users . What is the logic behind “top users” tag tab page? Is there any way to get more top users for a tag? Is something broken with the “top tags”? 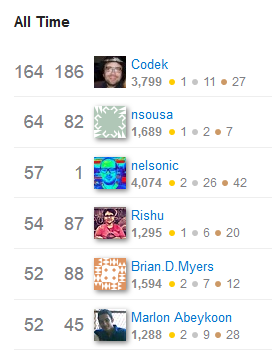 Is it possible to find who are the top 100 users in some tag?